Village Green of Southern Pines, North Carolina is a gated active adult community near the Pinehurst area. Unlike most age-restricted communities, Village Green welcomes homebuyers aged 48 and better. This established neighborhood of less than 60 attached homes offers affordable living in a scenic, private setting with 90,000 square feet of landscaping. Residents of Village Green enjoy a charming clubhouse where they can host a club meeting or community party in the multi-purpose room. Residents can take advantage of the area's comfortable four-season climate with outdoor amenities situated along tree-lined streets. A gazebo and walking path makes it easy to enjoy the community's great landscaping and mature trees. Village Green consists of 57 attached homes built between 1970 and 1972 in Southern Pines, North Carolina. Available on a resale-only basis, active adult homebuyers can find a low-maintenance home that has between 1,100 and 2,700 square feet of living space. These homes feature one to four bedrooms, one to three bathrooms, and outdoor parking. Residents of Village Green in Southern Pines appreciate living in a small, private community where neighbors aren t strangers. With beautiful pine and oak trees that soar over 70 feet, homeowners live in a well-kept neighborhood that embraces nature. Owning a home in the Village Green community allows residents to live a carefree lifestyle without having to worry about tiresome chores. The homeowners' association (HOA) collects a reasonable monthly fee that varies per unit size. The HOA fee includes basic cable television, common area maintenance, roof shingles, and exterior and grounds maintenance. The Village Green active adult community is located in Southern Pines, North Carolina. This Moore County age-restricted neighborhood is about ten minutes east of Pinehurst and 39 miles west of Fayetteville. Within a 20-mile radius you ll find 42 golf courses, miles of trails, and other outdoor recreational activities. When traveling even farther is on your agenda, the Moore County Airport is just ten minutes away. Village Green in Central North Carolina is a lovely 48+ active adult community that's near daily conveniences in a quiet location. There are plenty of activities available in Village Green. Here is a sample of some of the clubs, activities and classes offered here. 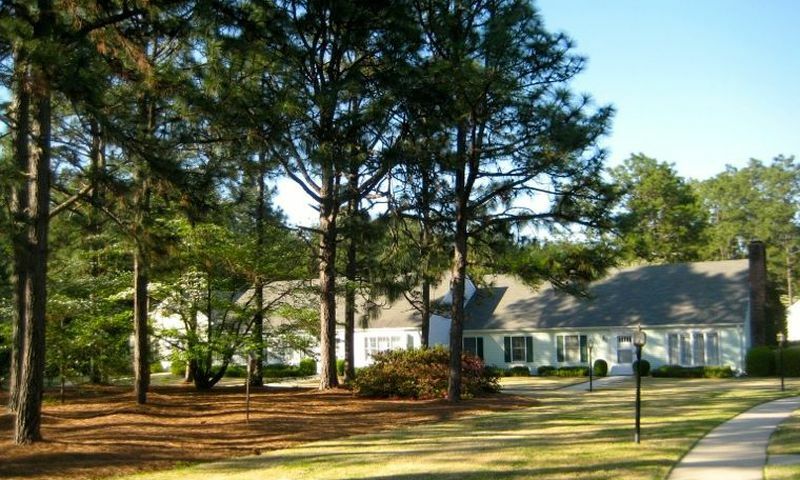 There are 57 attached residences that make up the Village Green in Southern Pines, NC. Built in the early 1970s homebuyers can find a low-maintenance home that has between 1,100 and 2,700 square feet of living space. Every home has one to two bedrooms on the first floor and some have two more bedrooms on a second level. Most of these resale homes have one to three bathrooms with plenty of parking. Please Note: Due to the age of this community, not all floor plans are available. 55places.com is not affiliated with the developer(s) or homeowners association of Village Green. The information you submit is distributed to a 55places.com Partner Agent, who is a licensed real estate agent. The information regarding Village Green has not been verified or approved by the developer or homeowners association. Please verify all information prior to purchasing. 55places.com is not responsible for any errors regarding the information displayed on this website.